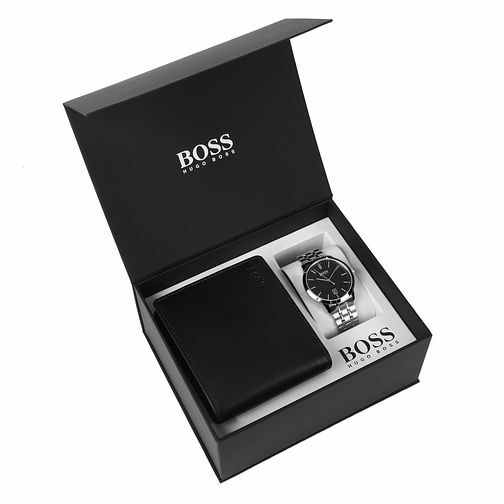 This sophisticated Watch & Wallet set by Hugo Boss features a sleek stainless steel timepiece accompanied by a signature black leather magnetic wallet. With a classic black dial, silver tone hour indice markers, three hands and a date display at the 6-o-clock position feature. A co-ordinating silver tone stainless steel bracelet completes this watch. The leather wallet features the Hugo Boss embossing on both the inside and outside. With ample room for four cards, a coin pocket and two note compartments, this smooth wallet and classic timepiece make for the perfect practical pairing. Presented in a Hugo Boss presentation box, ideal for gifting. Hugo Boss Men's Bracelet Watch & Leather Wallet Set is rated 3.8 out of 5 by 4. Rated 5 out of 5 by Anonymous from Great product. Classy, timeless and affordable. The perfect gift. This product is was of great value and is a classy present to give anyone, the steel design is timeless and the wallet is of great quality. I love it. Rated 5 out of 5 by Anonymous from Lovely set Lovely quality soft leather wallet. Stylish watch. In a nice presentation box. Easy to order.Quick delivery. Would recommend this lovely gift set a perfect gift.